just_in_electroincs has no other items for sale. Very fast delivery. Easy to install. Great cooler, I hate the AMD mount, though. Cooler works great on AM4 motherboards, but you have to mount it horizontal (perpendicular to the ram) and I wanted to mount it vertical (parallel to the ram). This is a problem if you don't have low profile ram, even though you can make it work. If I want to add ram to this board, I will have to make sure it is low profile, I won't be able to use any other. Great cooler, though. Quite and efficient. I purchased this item to install in a computer I built for my brother. I chose this because the easy install for AMD cpu. It is really quiet and a great investment for the money. 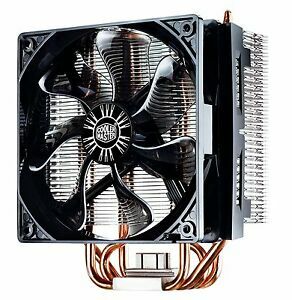 Thanks to this cpu cooler my desktop pc is whisper quiet even under a moderately heavy load. I would expect it would be a little difficult to install in a micro atx desktop case due to its size. As an upgrade from the basic processor fan, the product was easy to install and cheap in price.